Physical senses aren’t the only ways we perceive the world. Many of us are already using our psychic abilities without even knowing it. If you’re ready to unlock your psychic potential and realise your full abilities, this book will show you how – in just 20 minutes. Activating your psychic and intuitive potential is safe, fulfilling and fun. These things lie dormant potential in all of us: we all have the ability to access sensory levels that are not conventionally acknowledged. To discover and awaken these capabilities, we simply need to understand them. In 20 Minutes to Master Your Psychic Potential you’ll learn the key ideas behind mental power, and, through simple exercises, you’ll develop the capacity to find and build your own. You may discover that you are a natural healer or a latent clairaudient, or you could awaken a powerful clairvoyant vision. • Practical guidance to enhance your spiritual growth. Previously published as Principles of Your Psychic Potential, this ebook brings together classic text from an expert in the field with a new chapter, placed at the end of the book, that condenses all its ideas and techniques into a simple and digestible 20-minute read. This is part of the 20 Minutes to Master series, five indispensable guides that show you how to transform your life in simple and effective ways. Other titles in the series include 20 Minutes to Master Stress Management, 20 Minutes to Master Buddhism, 20 Minutes to Master Meditation and 20 Minutes to Master Wicca. 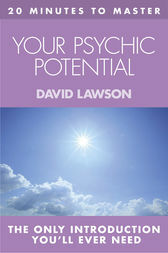 David Lawson is a leading international expert in self-help, self-healing and psychic development. David studied with Louise Hay, author of You Can Heal Your Life and developed the European program based upon Louise's techniques. Located in Hampshire, David now offers a unique combination of spiritual healing, success coaching and intuitive guidance. He is the author of several books, including Principles of Your Psychic Potential and Principles of Self-Healing.